Montana's mining industry is vital to the state's economy. It ranked twenty-sixth nationally in total nonfuel mineral production value, and sixth in the production of coal in 2004. The value of nonfuel minerals in 2004 was $624 million. The state produced 39,989,000 short tons of coal in 2004. The industry employed 5,190 workers, with an average annual income of $56,050. 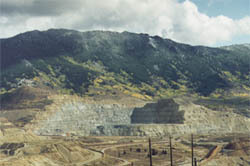 Montana's combined direct and indirect economic output gain from the mining industry was $2.3 billion (2005 data).